but really, lets get those pretty babies on the wall, stat. but….how, you ask? well, you’re in luck. i have an extremely talented sister who ever so carefully whipped up a handful of these lovely rooms to help photography clients get a better idea of how & where to display their photos, complete with arrangement ideas, that include frame & print sizes. here is our first “decorating with photos” installment…she calls it a “shelf nook.” i call it extremely exciting. a few things i want to point out: you’ll notice all of the frames pictured here are all larger than a 10×10. 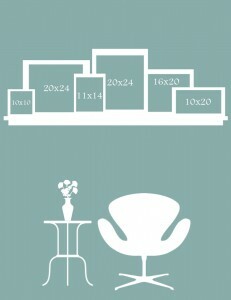 trust me…anything that is an 8×10 or smaller will get lost on your wall. those sizes look much better in a standing frame on a desk, bookcase or side table, and are perfect to mail to moms, grandmas & aunties for that purpose. additionally, my sister tami is such a rockstar, that she not only created all of these cute little rooms, but she also created them TO SCALE. thats right ladies & gents. she gets it. this way, you can get a feel for the size of portrait that would best fit & flatter your available wall space. can’t make up your mind between two sizes? go with the biggest that can fit on your wall. contrary to popular belief, large photos or paintings or whatever else you want to put on your walls can actually open up and visually enlarge your room instead of shrinking it. cool, huh? so…what if you don’t want to or wont be able to do patching or touch up when you move, but you LOVE the idea of having a smattering of photos adorn your walls? no worries. a shelf arrangement like the one above is an easy, painless solution, that lets you easily display your memories, but that is also easily change-able (is that a word?) and moveable. ***BONUS: are you a photographer? do you know one? check out tami’s site for other fun room layouts, and help me pass the word along about this awesomeness. you can purchase the templates or packages of these rooms and print them or share on your blog, as you help clients see how fun it is to decorate with photos. tami created these with photographers in mind, and made it possible for to drag & drop your own images into the frames so that your clients will be able to see exactly what their photos will look like on their walls. annnnnd, she even created a tutorial to help you do it in a jiffy. awesome? yah. i know. she’s that good. Hoorah! Thanks so much sis. I’m glad you like them.